The Edible Schoolyard kitchen classroom at Hunters Point. Photo courtesy of ESY HP. Who hasn't heard of The Edible Schoolyard in Berkeley? But many here may not know about another affiliated program in the Bay Area, The Edible Schoolyard at the San Francisco Boys and Girls Club in Hunters Point, which offers children in that food insecure community a chance to grow their own food, cook it, and eat it too. The Hunters Point Willie Mays Clubhouse afterschool program is getting a little extra exposure and financial assistance in conjunction with the 40th birthday celebrations for Chez Panisse. Earlier this week, the Today Show aired a segment with Alice Waters and Edible Schoolyard supporter actor Jake Gyllenhaal that was filmed at the Hunters Point program. 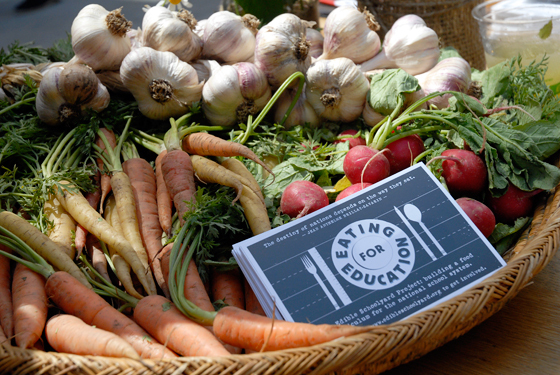 Tomorrow, as part of the Eating for Education campaign to raise awareness about and money for school gardens, San Francisco restaurants Bar Agricole, Bar Jules, Contigo, Delfina, and Zuni -- along with coffee companies Blue Bottle and Four Barrel -- will donate a percentage of the day's profits to the Hunters Point school garden and cooking program serving some 250 mostly low-income children of color from elementary age through to high school. The Bayview-Hunters Point area of the city is known more for fast food than fresh food; only about five percent of food sold in the neighborhood is considered fresh. For many restauranteurs, participating was a no-brainer. "The Boys and Girls Club in Hunters Point is a model program and this is a cause that's important to us," said Brett Emerson of Contigo. "Showcasing for children in a fun and engaging way the fundamentals of nutrition, respect for those that grow our food and passion for eating is key." Another Chez alum, Gilbert Pilgrim of Zuni, chimed in: "We believe that people will eat in a healthy manner if they start doing it while they are young. This is a worthy cause that deserves all our support." 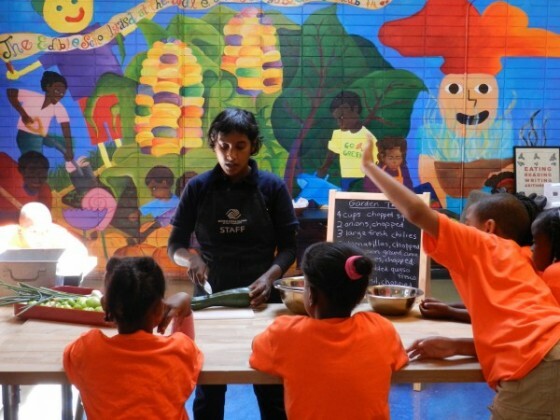 For the Boys and Girls Club, the campaign is an opportunity to connect with chefs and reach others in the food movement who value edible education for youth, said Brittany Johnson, a spokesperson for the organization. While Zuni is full for Saturday night, Contigo still has room for both reservations and walk-ins who want to eat well -- and support edible education at the same time.